1. Boil the milk till it starts reducing. 2. Add coconut, carrot and stir well. 3. Transfer to a blender and blend to a smooth paste. 4. Add little water to sugar and bring to a boil till it reaches an one string consistency. 5. Add the carrot-coconut paste, cardamom powder and stir well. 6. Pour into a greased plate and allow it to cool. 7. Before it cools fully, cut into desired shapes. 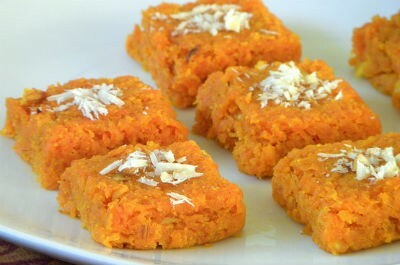 Feel free to comment or share your thoughts on this Carrot Coconut Burfi Recipe from Awesome Cuisine.